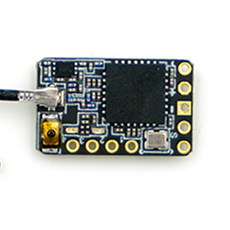 If you own a FrSky radio transmitter such as Taranis or a Horus, the best micro receiver is the FrSky R9 Mini. FrSky R9 Mini 900MHz Long Range Receiver. Although its a 900Mhz long range, this is perfect for gliders and slope sailplanes as you only fly eye sight. This little guy weighs at a record breaking 1.1 grams. 4 Channels that you might have to solder your leads. Supports redundancy function Low latency and high precision With RSSI output in SBUS Detachable Ipex connector antenna. This little receiver will fit anywhere as its the size of your pinky. A great option for your ultralight gliders.